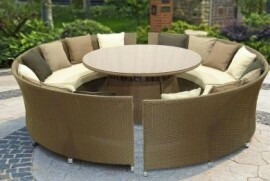 This stunning Toulouse Poly-Rattan 8 seater bench set will create a centrepiece of any patio this summer. The Toulouse is made from quality sturdy powder coated aluminium frame construction. The wicker is a weather resistant. This set also includes a FREE HAVANA planter set in brown.